The E.On Energy Research Center (ERC) is part of the multi-disciplinary research institution of the RWTH Aachen University. The ERC consists of three buildings: the main building, one office building and an experimental hall. The main building has been designed as an experiment in itself containing an advanced Building Management System to investigate different solutions for heating and cooling (including geothermal storage, CHP and cold via open sorption) and a set of solar panels on its roof. The experimental hall, which is equipped with a fuel cell, and an office building complete the scenario together with a small wind turbine (Enercon 500 kW). For the purpose of ELSA, these three buildings are considered as a small district. An ELSA battery energy storage system consisting of six 2nd life Renault Kangoo batteries was installed in a container in front of the experimental hall. The storage system has a total capacity of 96 kWh. The existing Building Management System (BMS) was expanded and upgraded by incorporating the new components and functionalities of the ELSA solution. This lead to a system able to control the operation of the energy system including the batteries following external signals or local regenerative energy production in real time. What is the special focus of the ELSA pilot site at the E.ON ERC? I think that the special focus of our pilot site is in the fact that it represents a typical and realistic non-residential district. In contrast to other pilot sites that, for example, focus purely on residential customers and flexibility only gained from 2nd life batteries, we can analyze the effect of multi-energy storage systems, such as thermal and electrical storage in a more heterogeneous area. Our district involves a highly complex and flexible main building with its own energy management system, an industrial test facility, an office building without any flexibility and, virtually included, a wind energy generation turbine - each of them forming a separate "block of energy units”. The flexibility provided by each individual block of energy units is coordinated by our hierarchical district management system in order to provide services to third parties such as an aggregator in the most efficient manner. However, the main logic behind the district management system is to always respect the local buildings privacy and own local objectives. 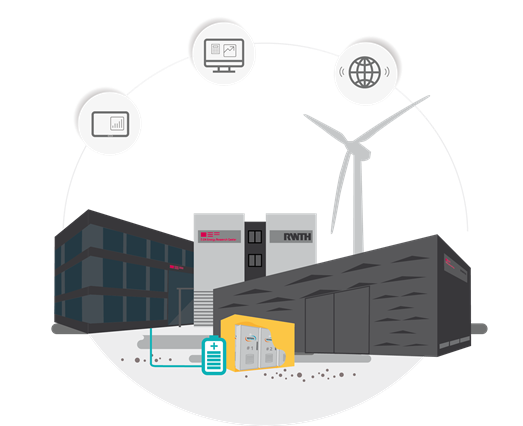 You are trialling the application of the ELSA battery storage system for a large building, the E.On Energy Research Center. Which services is the ELSA battery storage system providing at your pilot site? We apply a hierarchical district energy management system, which coordinates the blocks of energy units within the district in order to provide demand response services. In this sense, it is not simply the ELSA battery storage system that provides services, but the overall (flexible) intelligent coordinated devices in the district. This, for example, includes also flexibility gained from thermal storage. Our district management system will coordinate the blocks of energy units in order to follow the renewable generation on system level, minimize the CO2 emissions on system level, but also react to dynamic price signals so that the total energy costs of the district are reduced. What are the long-term benefits you expect from installing the ELSA system? In the past, we implemented many successful analyses and experiments that only involved the main building´s energy management system. However, now we are looking forward to expand the experiments and investigate how the intelligent energy management including flexibility from the ELSA 2nd life battery will improve the total flexibility utilization at district level. The additional installation of the ELSA battery at district level thus provides a new degree of freedom for the efficient performance of the use cases. The additional flexibility will lead to additional cost and CO2 savings.